The Sabbath holds a crucial position in Old Testament theology. In Exodus 20:11, God tells Israel to observe the Sabbath because He rested on the seventh day. The Sabbath is rooted in creation. In Deuteronomy 5:15, God tells Israel to observe the Sabbath because He brought them out of Egypt. The Sabbath is rooted in redemption. The Sabbath is called a perpetual sign to Israel in Exodus 31:13-17 and Ezekiel 20:12. Israel is exhorted throughout her history to keep the Sabbath properly. 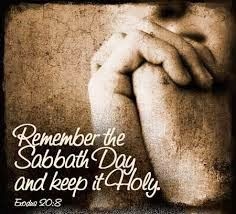 (See Exodus 35:2-3, Amos 8:5, Nehemiah 13:15-22) Even in Isaiah’s section on the New Covenant, which runs from chapters 40-66, there are sections exhorting God’s people to keep the Sabbath. (Isaiah 56:2, 8 and 58:13-14) All of these passages seem to indicate that the Sabbath will continue on forever. So why has the Church rejected the Saturday Sabbath in favor of a Sunday Lord’s Day? Has the Church left God’s Word or was there a good reason to change the day? Did the prophets see a day when the Sabbath would be changed? The answer to that is found in that the Sabbath is a sign, the promise of a new exodus, and the promise of a new creation. Let’s look at these three reasons for the transition from Sabbath to Lord’s Day. We know from the New Testament that most of the Old Testament signs are transformed in the New Testament. The clearest of these is circumcision, which has been transformed into the New Covenant sign of baptism. (I Corinthians 7:9, Colossians 2:11-15). It is worth noting that circumcision was called an everlasting sign in Genesis 17:13. We know this does not mean that the outward form of the sign lasted forever. We also have the Passover transformed into the Lord’s Supper. (I Corinthians 5:7-8) The temple and priesthood are not destroyed in the New Testament, but transformed. (I Corinthians 3:16, I Corinthians 6:19, Ephesians 2:21) The same goes for sacrifices. (Romans 12:1, Philippians 4:18, Hebrews 13:15) In other words, the New Testament teaches that most of the signs from the Old Covenant age have been transformed in the New Covenant because in the New Covenant the reality has arrived. However, the meaning of the sign was not lost, just the outward form it took. For example, the Passover was originally about the lamb killed to protect Israel from the Angel of Death in Exodus 12. We no longer put blood on our doorposts or eat bitter herbs. But the point is still the same. We need the blood of the Lamb to deliver us from the wrath of God. This blood is now represented in the wine and bread given at Communion. It is the same way with other signs as well. Therefore it should not surprise us that the Sabbath as a sign has been transformed in the New Testament. Second, the prophets taught that with coming of the Messiah there would be a new exodus so great that the old exodus would be forgotten. This is important because the Sabbath was to commemorate the exodus out of Egypt (Deuteronomy 5:15). Isaiah predicts this new exodus in 43:14-21 (see especially verses 16-17) and in 51:10-11. There are other passages in Isaiah that allude to the exodus event (See 63:11-12). Isaiah chapters 40-66 point forward to the ministry of Jesus Christ. From Isaiah 40:3,which is quoted in Matthew 3:3 to Isaiah 66:24, which is quoted in Mark 9:44-48, the New Testament authors take great pains to show that Isaiah’s prophecies were fulfilled in the life, death and resurrection of Jesus. When Jesus came the last great exodus out of Egypt began. Jeremiah is as emphatic about this coming redemption as Isaiah. God promises in Jeremiah 16:14-15 this new exodus will be so great that the old exodus will be forgotten. Isaiah gives a similar promise in 43:18-19, which is right after the verse about the new exodus. A similar promise is found in Jeremiah 3:16 where God says even the Ark of the Covenant will be forgotten. With the coming of the Messiah, the entire old covenant would be transformed. The transformation would be so great that the greatest events and articles, such as the exodus and the Ark of the Covenant, would be shadowy memories eclipsed by the greater reality. What does this have to do with the Sabbath? If the Old Testament Sabbath pointed back to the redemption out of Egypt, why wouldn’t the New Testament Sabbath point back to our redemption out of sin? It seems both biblical and logical that this new day should correspond with the resurrection day when all our enemies were overcome. Again, what does this have to do with the Sabbath? If the Old Covenant Sabbath was linked to the creation of the world, why shouldn’t the New Covenant Lord’s Day be linked to the day the world began to be remade, the resurrection of Christ. ← Are Women Teachers Necessary in the Church?